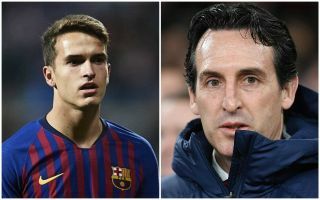 Arsenal manager Unai Emery has confirmed his club can only sign players on loan in this January’s transfer window amid links with Barcelona midfielder Denis Suarez. Emery’s words tie in with what has been claimed by Spanish publication Marca, who are one of a number of sources to report of Arsenal’s interest in Suarez. Marca explain that Arsenal will only have the funds to sign the 25-year-old permanently in the summer, so must take the player on loan until then. However, they suggest Barcelona are less keen on this arrangement, with the deal hitting something of an impasse. It remains to be seen if the Gunners can convince the Catalan giants to release Suarez on a temporary basis, or if they can find anyone else who plays a similar role who would be available on loan this January. Arsenal could do with more options in midfield as Aaron Ramsey nears the end of his contract and players like Granit Xhaka and Mohamed Elneny look just a little short of the required standard. Emery: "We cannot sign permanently. We can only loan players."